Belief in the Hereafter is one of the six pillars of Islamic belief required of a Muslim in order to complete his faith. The Prophet (sallallahu alayhi wasalam) informed us about events of the Ghayb (those beyond human perception) which will occur after death. This fundamental belief is only completed when one has firm faith in his heart in all those matters about which the Prophet (sallallahu alayhi wasalam) informed us. Ahlus-Sunnah Wal-Jamaa’ah (mainstream Muslims) believe in all of these events, whereas the people of innovation refuse to accept events such as the questioning in the grave, the bliss and the trials of the grave, the punishment in the grave, the passing over the Siraat (the Bridge set over Hell), and the setting of the scales. The reason for their denial is that, in their estimation, these matters cannot be proven by mere intellect. Since they consider their intellect to be the judge over everything, they do not believe in matters which are beyond their comprehension. Ahlus-Sunnah Wal-Jamaa’ah believe in the trial of the grave. The Arabic word for trial is 'Fitnah', which linguistically means to place gold in fire in order to remove its impurities; this word was thus later used in the sense of testing and trying. After the duration of this earth is over, Allah will command Israafeel [the Angel in charge of blowing the Trumpet] to blow it. At the first blowing, all the inhabitants of the heavens and the earth will fall unconscious, except those for whom Allah Wills otherwise. Then, the earth will be flattened and the mountains will be made into floating sand dunes. In short, everything will occur that Allah has informed us about in His book, especially in chapters 81 and 82 of the Noble Qur'an. Then angels will drive all of them naked, uncircumcised, and barefooted to the place of Hashr (Gathering). The first one to be dressed on that Day will be Prophet Ibraaheem . At the place of Gathering, the sun will descend close to the heads of people, and their sweat will engulf them. It will be up to the ankles of some of them, up to the knees of others, up to the chests of others, and up to the necks of others. The level of their sweat will be in accordance with their deeds. Some people on that Day will be sheltered by the shade of the Throne of Allah. When the conditions become unbearable for people, and the despair increases greatly, people will ask Allah to allow His messengers and prophets to intercede on their behalf and save them from their distress. Every Messenger and Prophet will direct the people to the Prophet who came after him, until they come to our Prophet Muhammad (sallallahu alayhi wasalam). He will respond by saying that he is the appropriate person for it. He will intercede for them, which will result in the beginning of Judgement. 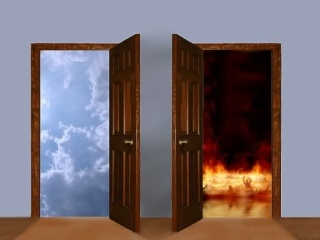 All the events that are bound to occur after death and on the Last Day, like reward and punishment, Paradise and Hell, the Reckoning and other events are mentioned in detail in the Divine revelations and in narrations from the Prophets. They are also available in the knowledge which the Prophet (sallallahu alayhi wasalam) has left us as his inheritance; whoever wishes to seek it will find it.